As of spring 2017 there is another Word to describe our NEW Super Circuit…. Outdoors! It’s exhilaratingly fast and uniquely one of a kind! The only Track in Ohio to feature an Indoor AND Outdoor section, master the technical, tight indoor sector and flow through the outdoor section. Our track has it all, long straightaways for the speed junkies, switchbacks, chicanes and sweepers for those looking for a challenge. 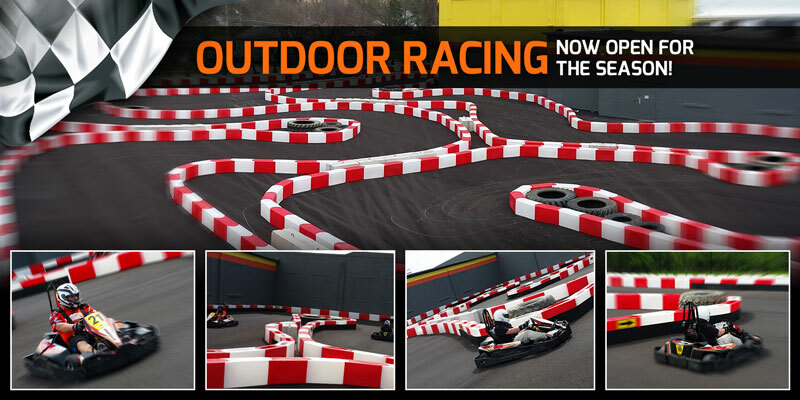 Featuring a unique transition from a Concrete to Asphalt racing surface from indoor to outdoor for even more fun! Our Full Super Circuit is nearly a ½ mile long, even our indoor track section is the longest in northeast Ohio at ¼ mile long! Check out the track map below to see both sections and get your heart racing! Live timing and scoring with monitors throughout the track allow racers to hone their skills and competition to be measured to within .001 Seconds. Think you have it mastered? We also run our track backwards and it is fully customizable. IMPORTANT TRACK INFORMATION! PLEASE READ! Being Ohio, the weather can be unpredictable. With that being said our INDOOR track is open year around only closing on holidays or for special events, all of which can be found on our calendar. HOWEVER, the outdoor section of our track is open WEATHER PERMITTING! We do not run the OUTDOOR section in the rain! It will be closed and the indoor only portion will be available for racing at that time. Staff at High Voltage makes the final determination on whether the outdoor track will be open or closed on any given day. We also do not run the outdoor section of the track in the winter; we will run it as long into the season as the weather will allow us and post on the calendar and other social media sites when it is closing for the season. Please check our social media sites below for live updates on whether the outdoor track is open. PLEASE NOTE THE OUTDOOR TRACK HOURS BELOW. INDOOR TRACK HOURS ARE UNCHANGED FROM THE HOURS YOU SEE AT THE TOP AND BOTTOM OF THIS PAGE!